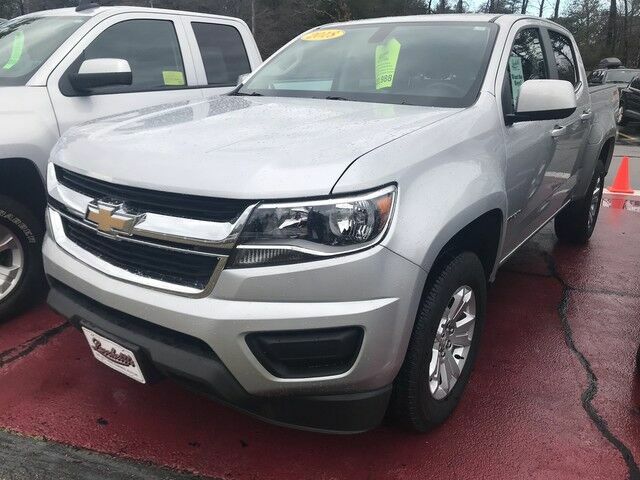 Lucchetti's Auto Center is excited to offer this 2018 Chevrolet Colorado. This Chevrolet includes: SEAT ADJUSTER, POWER PASSENGER LUMBAR CONTROL Passenger Adjustable Lumbar SILVER ICE METALLIC JET BLACK/DARK ASH, CLOTH SEAT TRIM Cloth Seats TRANSMISSION, 6-SPEED AUTOMATIC, HMD, 6L50 A/T 6-Speed A/T LT CONVENIENCE PACKAGE Fog Lamps Remote Engine Start Power Mirror(s) Heated Mirrors Rear Defrost AUDIO SYSTEM, CHEVROLET MYLINK RADIO WITH NAVIGATION AND 8" DIAGONAL COLOR TOUCH-SCREEN, AM/FM STEREO Smart Device Integration Navigation System AM/FM Stereo Bluetooth Connection Auxiliary Audio Input MP3 Player SAFETY PACKAGE Lane Departure Warning WHEELS, 18" Tires - Front All-Season Aluminum Wheels Tires - Rear All-Season ENGINE, 3.6L DI DOHC V6 VVT V6 Cylinder Engine Gasoline Fuel LPO, BEDLINER, DROP-IN Bed Liner LUXURY PACKAGE, CHROME A/C Power Mirror(s) Climate Control Auto-Dimming Rearview Mirror Heated Mirrors Power Passenger Seat Heated Front Seat(s) Passenger Adjustable Lumbar Driver Adjustable Lumbar *Note - For third party subscriptions or services, please contact the dealer for more information. * Drive home in your new pre-owned vehicle with the knowledge you're fully backed by the CARFAX Buyback Guarantee. This well-maintained Chevrolet Colorado 4WD LT comes complete with a CARFAX one-owner history report. This Certified 2018 Chevrolet Colorado 4WD LT is a brilliant example of quality meets reliability. This vehicle has been thoroughly inspected and has an assured quality that you won't find with other vehicles. No matter the terrain or weather, you'll drive at ease in this 4WD-equipped vehicle. With exceptional safety features and superb handling, this 4WD was engineered with excellence in mind. Knowledge is power and with the complete records of this pre-owned vehicle, you'll have the power to make a wise purchase. If you are looking for a pre-owned vehicle that looks brand-new, look no further than this Graphite Metallic Chevrolet Colorado. Drive away in this amazing Chevrolet Colorado and enjoy the realization of having the manufacturer's factory warranty coverage still in effect.